Going back to the basics never tasted so good! 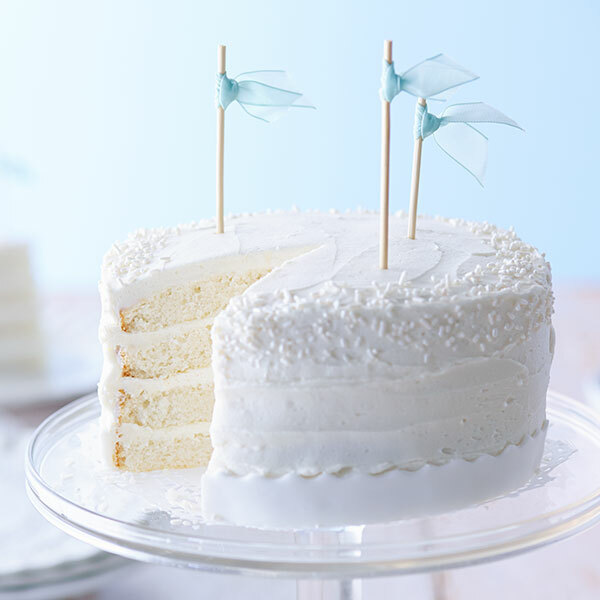 With our White Cake and Buttercream Frosting recipes, you'll have trouble deciding which is better, the moist vanilla cake or the creamy frosting. Thankfully, you don't really have to decide because they are always better together! Preheat oven to 350°F. Cut parchment rounds to fit the bottoms of 2, 8-inch cake pans. Spray cake pans with nonstick cooking spray, place parchment rounds in bottom of pans, spray parchment, and then flour the pans. In a liquid measuring cup, combine milk and vanilla. In a medium-size bowl, sift together flour and baking soda. Set aside. In the bowl of an electric mixer fitted with a paddle attachment, mix together butter and sugar. After the ingredients are mixed together somewhat, turn mixer to high and beat until light and fluffy, about 5 minutes. Turn mixer to low, and alternatively add flour and milk mixtures. Start and end with the flour mixture. In a separate bowl, beat egg whites until stiff peaks form. Fold egg whites into batter until just incorporated. Pour batter into prepared pans. Bake for 20 to 25 minutes or until a toothpick comes out clean. Cakes may need to be rotated halfway through baking, depending on oven. Cool cakes in pans on wire rack for 10 minutes. Remove from pans and remove parchment rounds. Continue to cool on racks for another hour. In the meantime, make the frosting.